Today’s plan is to activate Mount McDonald on 2m and 70cm SSB. Mount McDonald at 789 metres ASL is close to the eastern flank of the Brindabella Ranges peaking at 1700 meters ASL. From Mount McDonald looking south-west towards Melbourne the Brindabella Ranges are a radio signal ‘road block’, attenuating most if not all of my 144 MHz SSB signal. 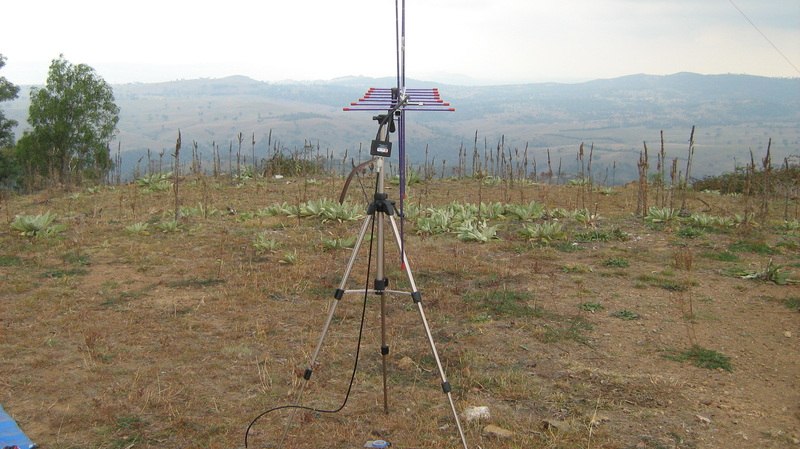 For this activation my best option is to rotate the 3el yagi starting from the west and working through north to the east and south-east for Canberra southern suburbs. The outlook to the north and east is free of vertical obstructions, aircraft enhancement is likely for 2m propagation into Sydney and further north to Newcastle and Port Macquarie. For directions to this summit see my post SOTA Mount McDonald 18 February 2014 The ascent to the summit is 205 metres (672 feet) over 2.8 km (1.7 miles) taking 45 minutes. Mount McDonald Stone Trig. 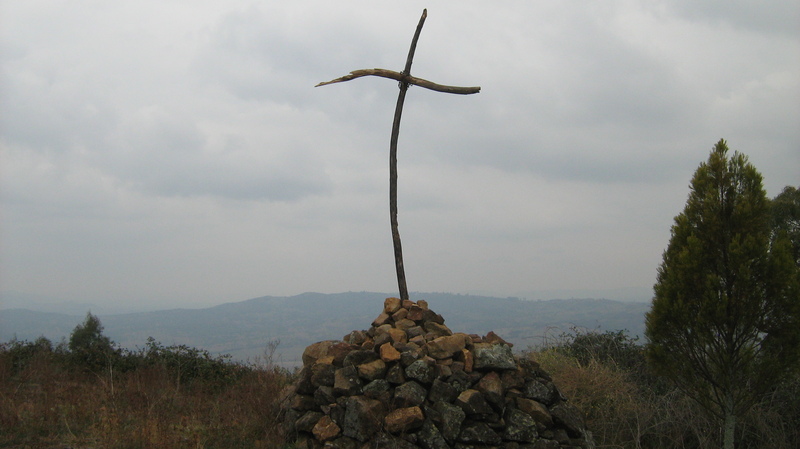 Since my last visit the cross constructed from tree branches is new. The smoke haze is a product of the prescribed burns. 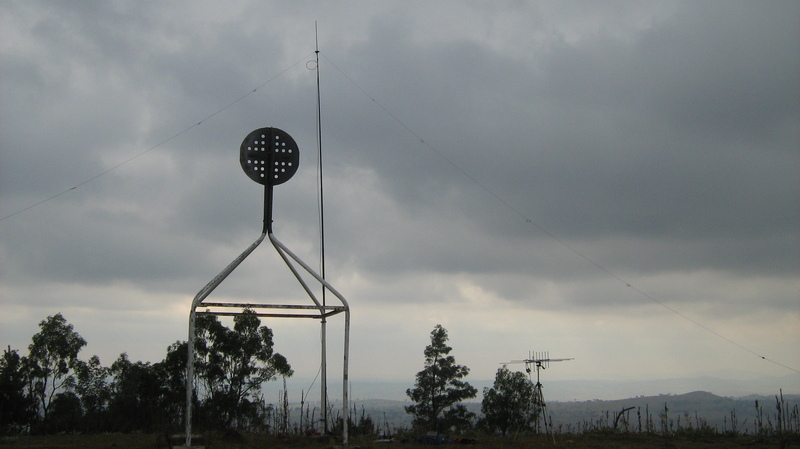 view east towards Canberra (18 km) through the dual band Arrow VHF/UHF Yagi directing radio signals to the geographic center of Canberra. Black Mountain Tower normally visible on the horizon is today consumed by smoke haze. a Silva Compass set to north directly underneath the Yagi. 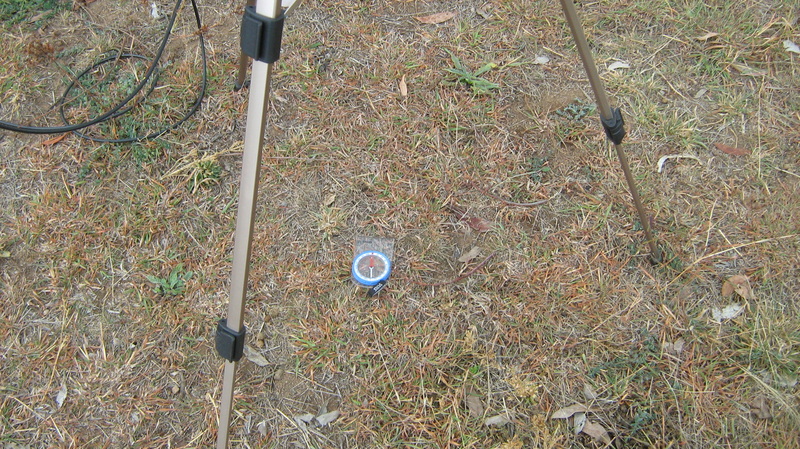 On days with low visibility, I use the compass to help set the antenna bearing for target locations. For this activation I don’t have prearranged chasers in Melbourne (480 km south-west) listening on 144.200 MHz. I started the activation at 2155 UTC on 144.200 MHz by posting spots to SOTAWatch plus VKLOGGER (144 MHz and above). To qualify the summit on 70cm I need 4 unique chaser contacts. Without too much fuss I qualified the summit on 432 MHz in 21 minutes, 70cm contacts included Graeme VK2FPQ, Dave VK1DJA, Rob VK1KW, Ian VK1DI, Wedge VK1GP, Al VK1RX and Andrew VK1MBE. 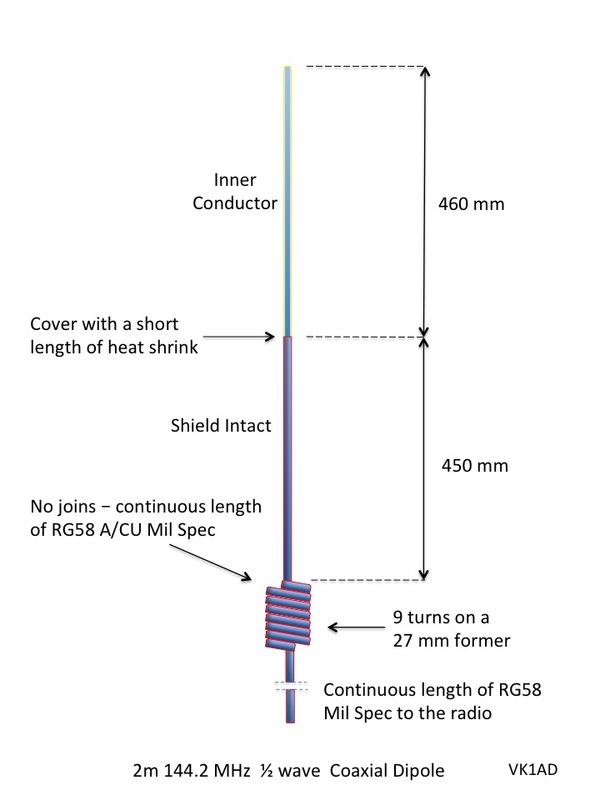 Of interest to the readers, and myself are the types of 2m and 70cm antennas used by chasers. 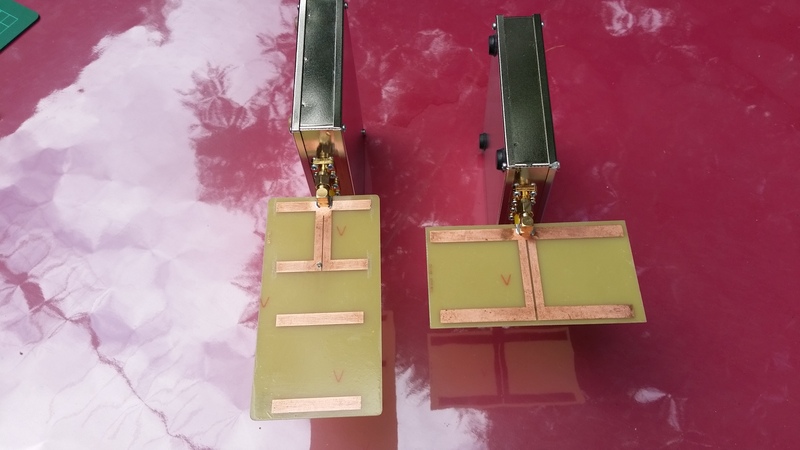 Al VK1RX and Andrew VK2UH have kindly sent in photos of their respective temporary ‘backyard’ 2m and 70 cm horizontal polarised antennas. 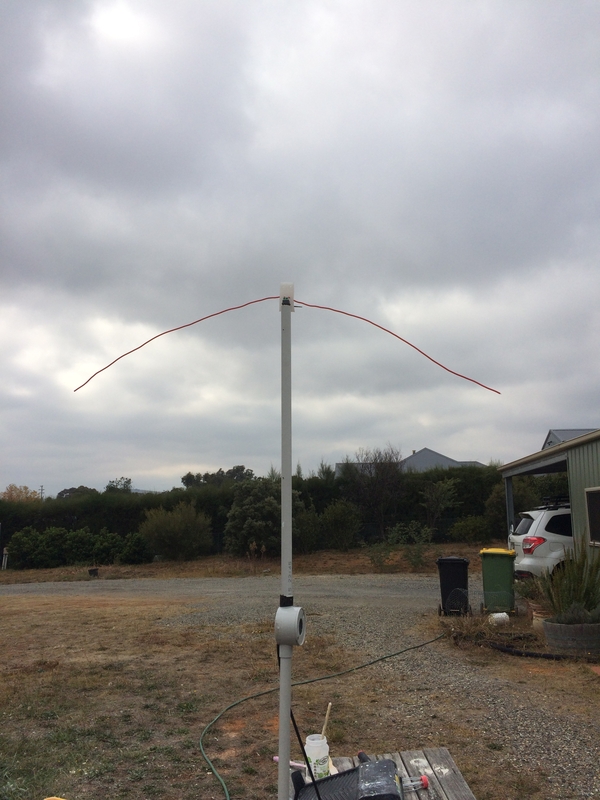 Al’s ‘backyard’ portable antenna comprises of a 2m copper wire 1/2 wave dipole and a 70cm ground plane mounted in the horizontal plane, neither of these antennas are a permanent feature in Al’s backyard. On 70cm Al and I experimented with QRP power levels down to 2 watts, thanks Al. See pictures below. 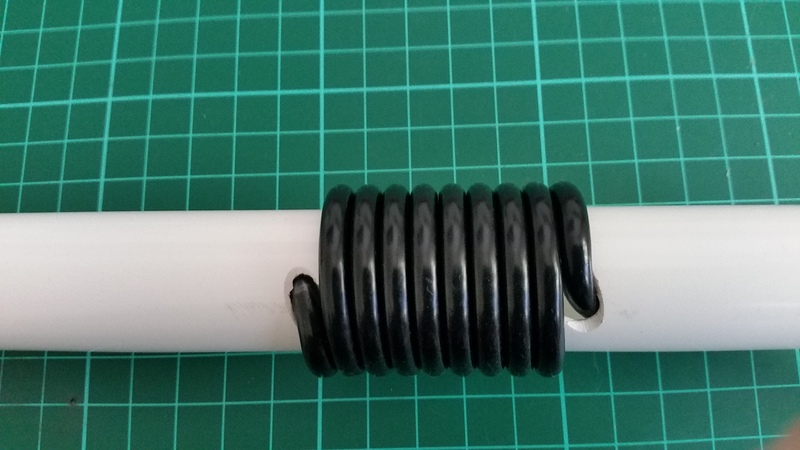 If you would like to share a photo of your 2m or 70cm portable ‘backyard’ antenna I am happy to include the photo in this blog? 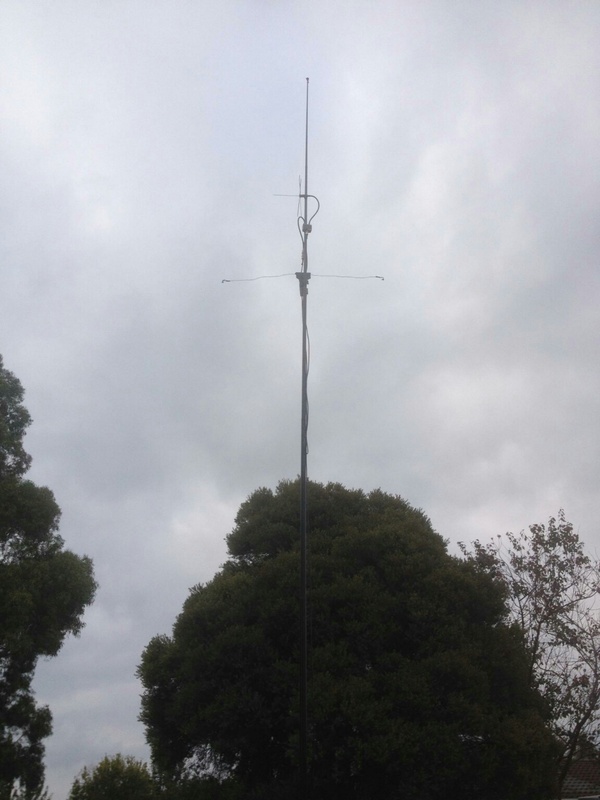 21 km from Mount McDonald, VK1RX temporary backyard 2m dipole and a 70cm ground plane mounted for horizontal polarisation, 6 metres above the surrounding ground. The black box in the center of the antennas is a VHF/UHF duplexer. Photo supplied by Al VK1RX and published with his permission. VK2UH backyard precision 2m dipole 2 meters above the ground. 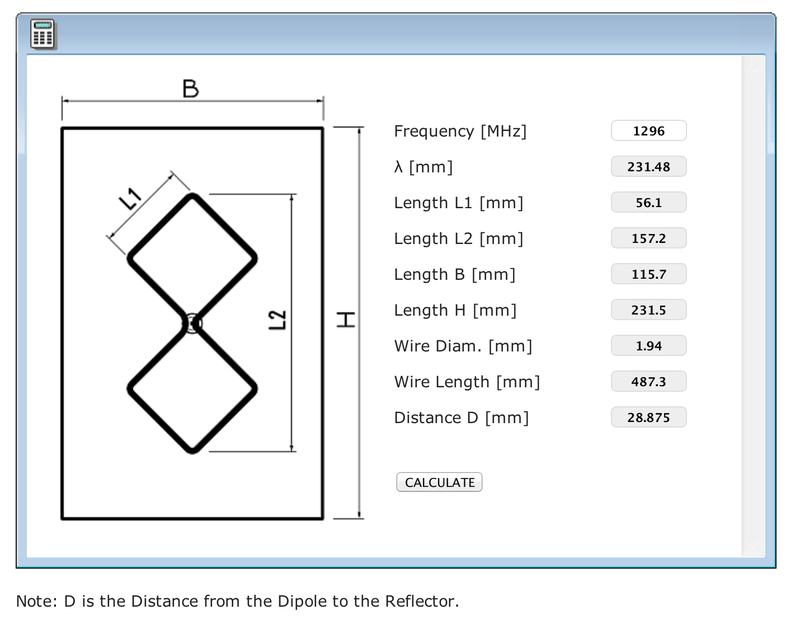 This dipole works well at the 3rd harmonic 432 MHz. Andrew’s backyard antenna is 52 km north of Mount McDonald. Photo supplied by Andrew VK2UH and published with his permission. On 40m 7.095 MHz, 21 chasers including my first contact with Chris VK4FR mobile traveling across the Hay Plain, NSW. Chris is a regular contributor to this blog. 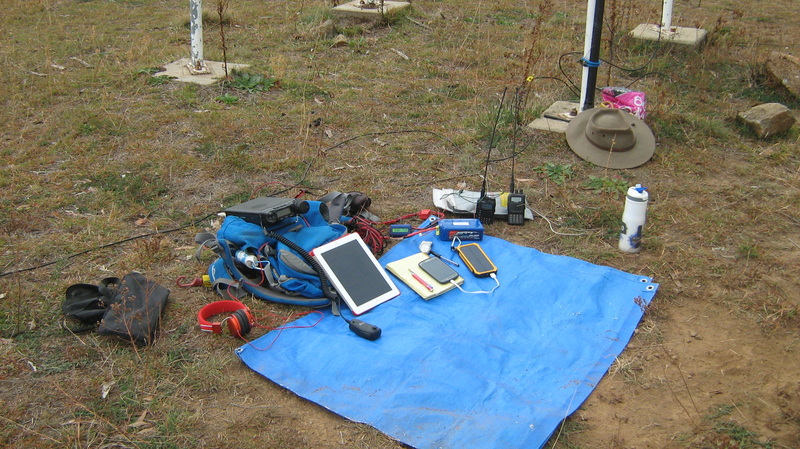 A 2nd first-time contact was with Maria VK5FMAZ operating portable in a conservation park with hubby Paul VK5PAS. One Summit to Summit (S2S) contact made later in the session with Andrew VK1DA/2 at Mt Mundoonen VK2/ST-053. SOTA to VKFF Park contacts included Peter VK3ZPF operating from VKFF-0055 Brisbane Ranges NP, Gerard VK2IO in VKFF-0595 Hunter Wetlands NP and Maria and Paul both in VKFF-0823 Cooltong Conservation Park. On 30m 10.130 MHz, one chaser Steve VK7CW and I did hear Mike VK6MB with a 5-2 signal report. On 20m 14.310 MHz one local chaser Peter VK1XP. On 15m 21.350 MHz and 10m 28.480 MHz one local chaser Andrew VK2MWP. After 3 hours and 40 minutes of non stop radio chat, I packed up and headed back to the car for lunch. Another good write up and it’s great to be in the log! 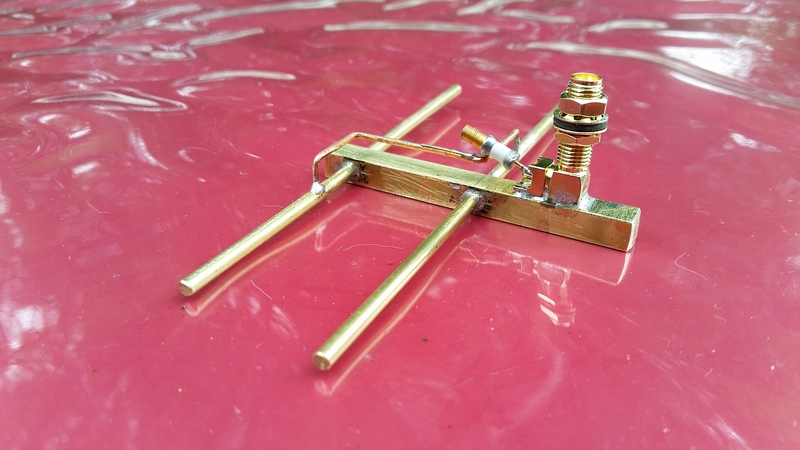 About to commence work on a folding hex beam so your 30M contact(s) were of interest as I would like to try this band for data (PSK, JT65/9) into EU from the parks.